The Timberwolves Lacrosse program strives to serve our community by providing a competitive, fun, and safe environment where our Lake Villa youths develop as athletes, learn teamwork and the love of the game. This page provides a preview of the Timberwolves Lacrosse schedule for the upcoming year. Dates and activities are subject to change. Winter lacrosse activities are for players looking for opportunities to play lacrosse even when the snow starts to fall. The Timberwolves organize and recommend a variety if indoor leagues and clinics designed to keep our players skills sharp while having fun. Grant Winter Lacrosse: Offered by the Grant High School Lacrosse Club and recommended for 7th & 8th graders and 1st - 6th graders. Equipment available to Timberwolves players at no charge. Sessions are held at the Round Lake Sports Center. The season runs January through February. Monday, January 15: Early Bird Registration Discount Ends. Sunday, January 27th: Free beginner clinic at the Roundlake Beach Sports Complex for grades 1st - 8th. The Lake Villa Timberwolves are members of the Illinois Boys Lacrosse Association (IBLA). The IBLA offers a competitive spring league of local area teams grouped by region with multiple levels of play (A, B, and C). The Timberwolves place teams at levels where our young players are best able to develop and compete. The spring season has weekly regular season games running from April to June and capped by an end of season league tournament. Teams practice three times per week. Practices involve the basic fundamentals in stick work, game play, and sportsmanship. As the team progresses, more advanced techniques and plays are introduced. Friday, March 1: Spring Lacrosse teams registered with IBLA. Sunday, March 3: Free Coaches Clinic with True Lacrosse at Antioch HS from 1pm - 4pm. Thursday, March 7: Team placement with IBLA. Monday, March 11: Game scheduling begins for Spring season with IBLA. Sunday, March 24: Free Coaches Clinic with True Lacrosse at Lake Villa West Campus from 9am - 12pm. Thursday, March 28: Waivers and Code of Conduct due to IBLA. TBD: Optional skills and conditioning clinics. Monday, April 1: Spring lacrosse practices begin (coaches determine practice days). Sunday, April 7: IBLA spring season opens. Sunday, April 14: IBLA spring season games continue as scheduled. 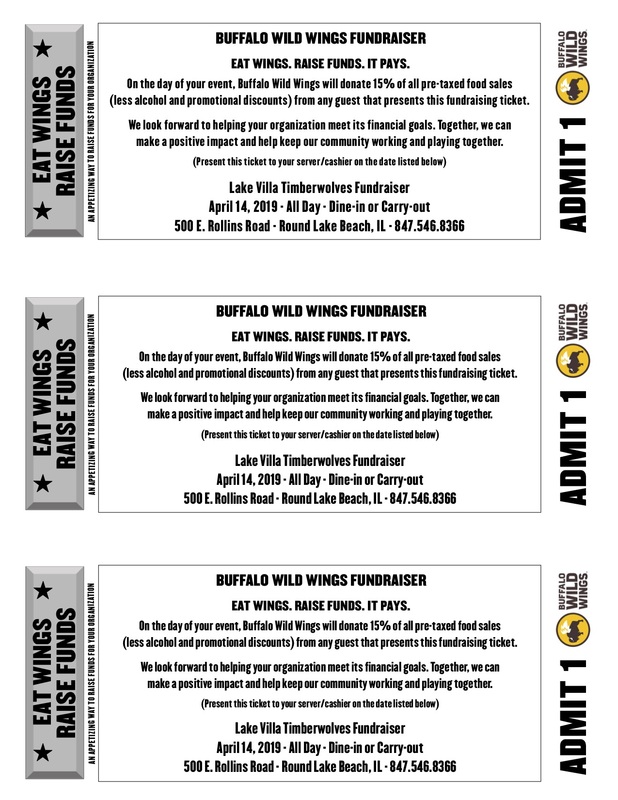 Buffalo Wild Wings Fundraising Event at BWW in Round Lake Beach. Print this coupon to redeem 15% of food back to LVT Lacrosse. Dine-in or carry-out. Sunday, April 21: Easter Sunday - expect a limited game schedule. Wednesday, April 24: Final Spring Team rosters submitted to IBLA - no movement after this date. Saturday, April 27: Come out to support your local NCAA Division III lacrosse team! We would love to see Timberwolves REPRESENT at the Carthage vs. North Central at Carthage College on April 27th. Timberwolves players will be invited to an on-field experience, but we need to know how many plan to attend before that can be confirmed. Please RSVP to your coach or team mom (include # players & non-players) by April 13th. Admission is FREE. Sunday, April 28: IBLA spring season games continue as scheduled. Sunday, May 5: IBLA spring season games continue as scheduled. Sunday, May 12: Mother's Day - expect a limited game schedule. Friday, May 17: Ultimate Ninjas Fundraiser. Grab your friends and teammates for a fun Friday at Ultimate Ninjas in Libertyville, 4:30-6:30PM. CLICK HERE for more information and to sign-up. Sunday, May 19: IBLA spring season games continue as scheduled. Sunday, May 26: IBLA spring season games continue as scheduled. Wednesday, May 29: IBLA All-Star Game. Sunday, June 2: IBLA spring season games continue as scheduled. Saturday & Sunday, June 8-9: IBLA League Playoffs (Junior, Minor, Major). Summer lacrosse activities are for players who wish to take their game to the next level with tournament play and skills camps. The Timberwolves participate in tournaments where our teams are competitive while keeping the costs and travel locations reasonable. Summer travel lacrosse is a great experience for player, families, and lacrosse fans alike. Timberwolves participation in summer tournaments will be based on player interest and availability. Summer activities and schedule TBD. Fall lacrosse activities are designed for our two sport athletes who have a primary sport in the fall, but still wish to pick-up the lacrosse stick when they can. The Timberwolves encourage multi-sport athletes and expect other sports and school activities to take precedence during the lacrosse off-season. During the fall, the Timberwolves participate in a recreational fall league. Fall activities and schedule TBD.